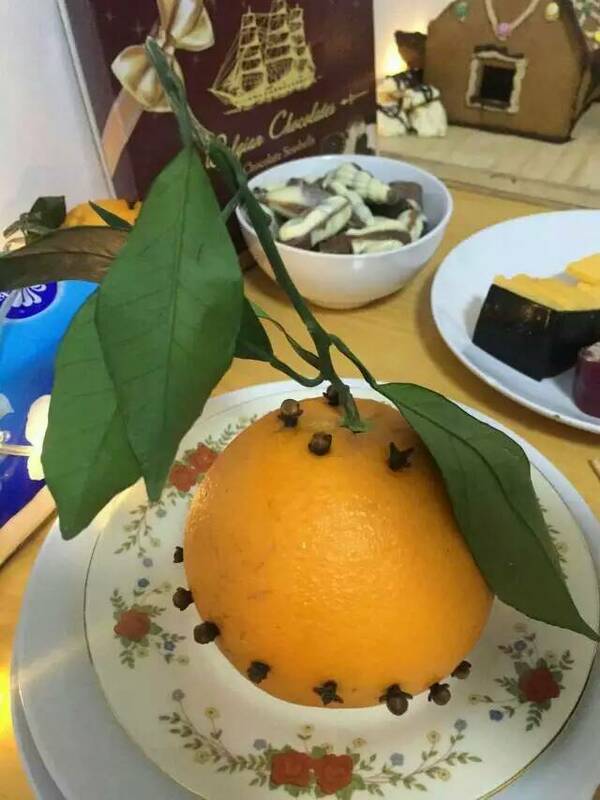 This is my second Christmas in China, but my first as a family of three, and our first in our more permanent home, so I really had a chance to create some atmosphere and get into the Christmas spirit*. So I decided to throw a Christmas party for R’s cousins! You can find a pretty good selection of international and imported foods in Dalian, if you’re willing to look for them. I made roast chicken with ‘cranberry sauce’**, IKEA meatballs, two homemade loaves of bread, with English cheeses, salt and vinegar crisps. To finish off we had Belgian chocolates and a gingerbread house, and to drink I made mulled wine and mulled apple juice, and we also had Bailey’s. To further increase the culture shock for our guests, this was laid out as a help yourself buffet, to seat and eat on your lap. “How British,” my husband said. I’m really pleased with how it went. R’s cousins seemed really interested, especially in the Pomanders (oranges adorned with cloves), and tried everything with enthusiasm, as well as taking a million photos to document the strange foreign customs. I think they liked trying all the different drinks too. Whilst I planned the menu to be as easy to prepare as possible – I made most of it in advance – I think it impressed. My big disappointment though was that I prepared the gingerbread house the day before and it collapsed overnight, perhaps because our kitchen is a bit damp. If I stay in Dalian for Christmas again next year, I’ll definitely do the same again, and maybe even scale it up a little! *Compared to last year when we lived in a rented, unheated apartment in dusty Guilin, a much less developed city in Southern China. **It was actually Lingonberry jelly from IKEA but close enough! 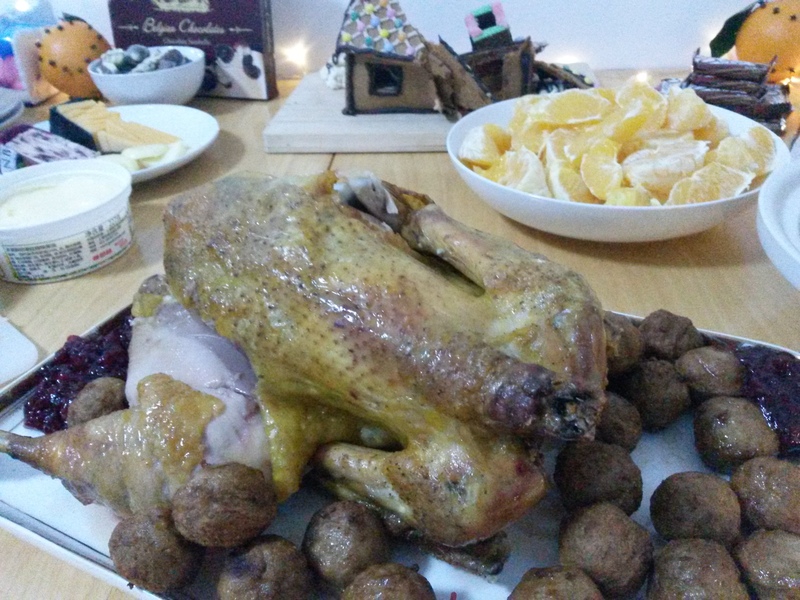 This entry was posted in Baby, Family, Food, Friends and tagged Christmas, Christmas food, cultural differences, Dalian, intercultural differences, living abroad, mulled apple juice, mulled wine, pomander, turkey. Bookmark the permalink. It sounds like you had a nice Christmas!! Happy holidays!! Woah, amazing! You prepared a super nice party! And you did everything yourself? I am super impressed! No matter when it was done, it is still a lot of work! And the gingerbread… I didn’t even know it was possible to do that, haha. Wow I am really impressed that you took so much afford in preparing everything. It is great to hear that your guests appreciated everything and had a lot of fun. To tell the truth, I am also impressed by the Pomander, I’ve never seen something like this before. I’m currently trying to imagine how it smells. 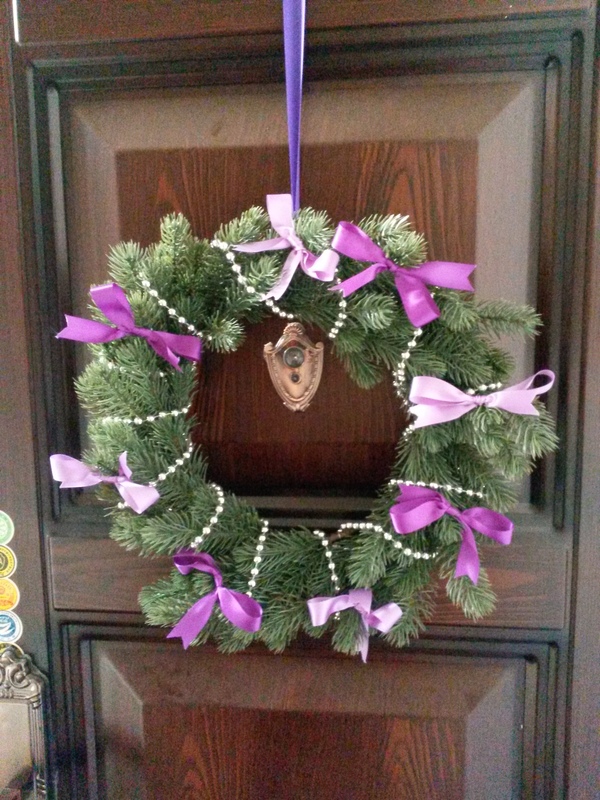 Ah, i first made a Pomander at Brownies as a child, such a lovely traditional decoration, and they can also been used as pot pourrei in the wardrobe. They loved to hear about a traditional decoration. Sounds like you had a very well planned Christmas (a very British one! 🙂 ). It is never easy to celebrate in a similar fashion as at home when living abroad. Nice job! The gingerbread house looks great! Did you go with Eastern or Western eating implements? We only have chopsticks and spoons at home, no knives or forks 😛 but I took the chicken back to the kitchen after the photo to be chopped up! 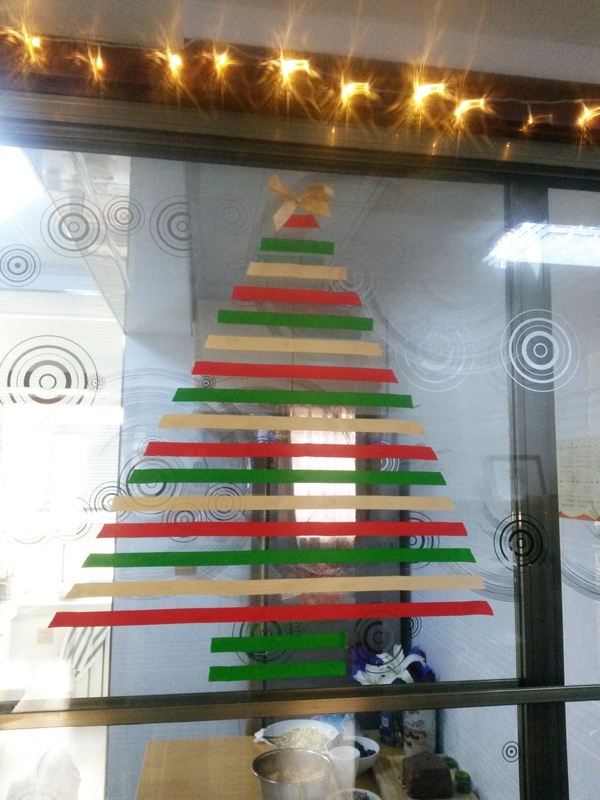 Christmas with an English flavour! Well done! We only have a very limited selection of foreign food in this part of Turkey eg one brand of Italian pasta. There are a couple of obsecure Turk soya sauce but are expansive. However, things may change. On my way back from Athens via Istanbul, there were two Chinese guys in the business class of my flight. This is a very small city, it is not a tourist spot. Recently, I saw a Chinese guy in a butcher in the City Centre (there is a group of Chinese men from China working in a local cement factory). Gossips are rife here and it travels fast. Sounds yummy and great that everyone really liked it! The gingerbread house sounds great, always reminds me of Hänsel and Gretel ;D.